One of my favorite photos that I took last year was featured in this blog post titled "The Miraculous Staircase." I liked it so much that I sent the image off to Image Wizards to have a metal print made of it. For those of you that have never had a metal print made, I highly recommend doing so as the metal makes prints look absolutely awesome. The print now hangs proudly in my home. 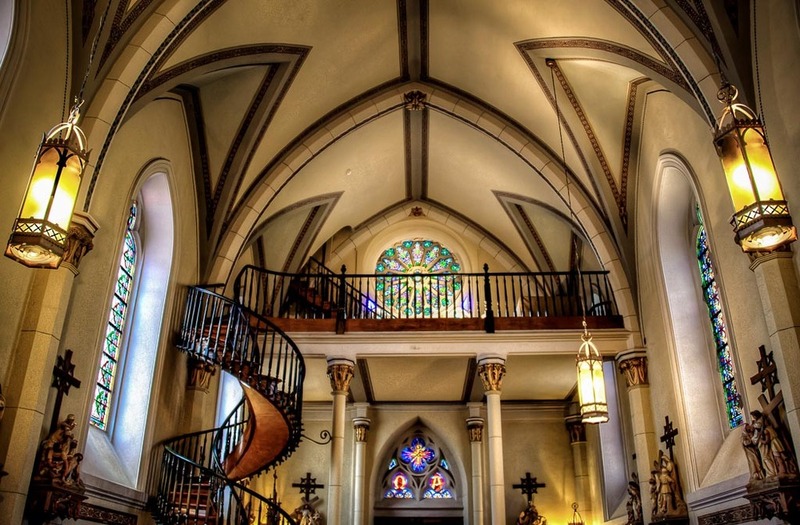 The staircase itself is the dominant feature of the Loretto Chapel in Santa Fe. It stands 22 feet tall and makes two 360 degree turns from the floor to the small choir loft above. Perhaps the most amazing thing about the staircase is that it was built with no glue or nails -- only square wooden pegs with no center support. Once a Roman Catholic Church, the Chapel now serves as a museum and can be rented for weddings. I wanted to show a different view of the staircase than in the original post to better show its relation to the rest of the small chapel. If you are ever visiting Santa Fe, make it a point to spend some time at the Loretto Chapel.